Originally hailing from Corpus Christi, life has taken Memnoir across this country and around this world... till one day, landing in the City of Lost Angels. A lifelong passion for music and a lifetime's stories of love, loss, and all the scars between evolved Memnoir's songs into the hungry and haunting pieces it will very soon become known for. After years of searching for the right people to complete the project, Memnoir now collaborates with a handful of select musicians from around the world to bring the songs to life. Memnoir's music is schizophrenic at times, culling from an eccentric collection of influences. But there's meaning in the madness. Art in all the chaos. A soundtrack for the stage we call our lives. Feb 2015 Rumors of our death have been greatly exaggerated. There are several new projects in the works including a new song and inclusion on a soundtrack for a new independent film. More info soon. Aug 2014 We are psyched to announce the release of the newest Memnoir song Rain - a dark and haunting tribute for the tragic hero. The new song is now available on Amazon, iTunes and Soundcloud. July 2014 Brand new Memnoir merchandise available: shot glasses, dog tags and new tshirt designs. 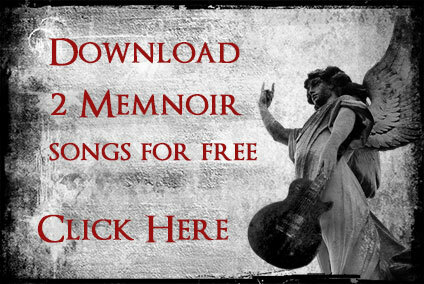 Visit the Tribute section to see what Memnoir music and merch are in stock.